Obituary – Nelson, Eleanor M. (Hamous) « Perry High School Alumni Association, Inc.
Senior Basket Ball, Normal Training. ﻿Eleanor Nelson, resident of Perry since 1922, died at 12:15 a.m. Saturday, Oct. 9, 1993, at Perry Memorial hospital. Arrangements were pending Saturday at Brown Funeral home. Memorials may be made to the Oklahoma Medical Research Foundation for emphysema. Born March 9, 1905, at Lindsey, Neb., she was the daughter of Frank and Esther Hamous. The family moved to Perry in 1922 where she finished her senior class year at Perry high school. 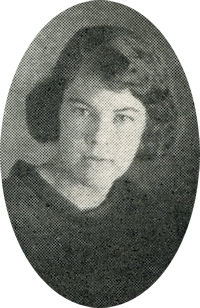 She attended Oklahoma A.& M. college and earned a teacher certificate. Mrs. Nelson taught at Star rural school in Noble county. She was married Aug. 27, 1925, at Enid, to Robert (Bob) Nelson, who preceded her in death May 17, 1991. After marriage, they established a home on a farm south of Perry where they lived until 1971. They moved to Perry that year and lived at 718 Sixth street. She had been a resident of Perry Nursing home. A member of the First United Methodist church she was a member of the Women’s Missionary Society and a charter and active member of Hunter homemakers group. Survivors include one son, Glen Nelson, Phoenix, Ariz.; two sisters, Ethel Polecek and Beulah Newell, both of Enid; four grandchildren and 19 great grandchildren. She was preceded in death by her parents, husband, three brothers, one sister, one grandson and one great grandchild.